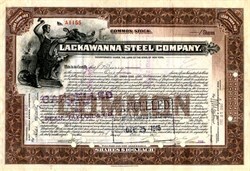 Beautifully engraved certificate from the Lackawana Steel Company issued no later than 1912. This historic document was printed by the American Banknote Company and has an ornate border around it with a vignette of a steelworker forging steel. This item has the signatures of the Company’s Vice president, Moses Taylor and Treasurer, J. P. Higgerson and is over 94 years old. The City of Lackawanna was originally the Limestone Hill section of the Town of West Seneca. 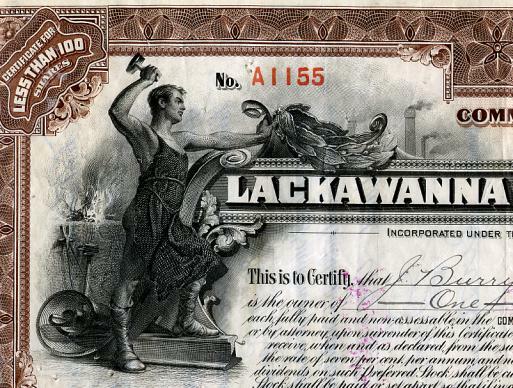 Lackawanna was incorporated as its own city in 1901 shortly after the Lackawanna Iron and Steel Company of Scranton, Pennsylvania decided to move here. The city with its new steel plant attracted people from many lands to settle here and make their homes. Located along Lake Erie, Lackawanna was a center of iron and steel manufacture throughout most of the 20th Century and prospered throughout the first part of the century. With the 20th century growth of the steel plant, at one time the fourth largest in the world, came the continued growth of the city and its institutions. 1857 - Earliest predecessor company, Saucona Iron Company, is formed in South Bethlehem, Pa.
1861 - Name of company is changed to Bethlehem Iron Company. 1899 - Bethlehem Steel Company, a predecessor to Bethlehem Steel Corporation, is formed. 1904 - C.M. Schwab forms Bethlehem Steel Corporation, becoming president and chairman of the board. Facilities include steel plant in South Bethlehem, iron mines in Cuba and shipyards on East and West Coasts. 1908 - Bethlehem's new Grey rolling mill begins production of the nation's first wide-flange structural section, which revolutionizes building construction and makes possible the age of the skyscraper. 1914 - At beginning of World War I, Bethlehem has annual steelmaking capacity of 1.1 million tons and employs 15,600 people. During the war, Bethlehem produces vast amounts of ships, armor, ordnance, guns and munitions for the U.S. and Allied forces. 1922: In October 1922, Bethlehem Steel, the second largest steel company in the United States, acquires Lackawanna Steel for ($60 million) and iron ore mines in the Great Lakes region.. The Lackawanna plant, already over twenty years old, has become antiquated. The company had made few improvements, and was quickly falling behind newer plants in other parts of the country. Bethlehem buys it cheap and, banking on a docile and defeated work force, spends over $40 million during the 1920s modernizing the plant. Bethlehem is interested in the growing automobile market. Buffalo, with a significant automobile industry of its own and with easy access to Detroit and other market places, is viewed as a crucial node in the developing geography of the automobile industry. 1941 - United States enters World War II, and Bethlehem operations shift to all-out war production of steel plate for ships and tanks, structural steel for defense plants and forgings for guns, shells and aircraft engines. Bethlehem's 15 shipyards build 1,121 ships, more than any other shipbuilder in World War II. At peak of production, Bethlehem employs almost 300,000 people, 180,000 of them in shipbuilding. During WW2, During the war, Bethlehem-Lackawanna Steel becomes the world's largest steelmaking operation. It employs 20,000 workers on a 1,300-acre site. 1964 - Bethlehem's first basic oxygen furnaces begin steelmaking at Lackawanna. 1965 - 20,000 workers employed in the lackawanna plant. For the first time, more than 10 million tons of foreign steel are imported into the United States. 1973 - Bethlehem produces 23.7 million tons of raw steel and ships 16.3 million tons of finished steel -- both records -- and reports net income of $207 million. 1977 - Bethlehem reduces steelmaking capacity at Lackawanna and Johnstown. 1977: Bethlehem's Lackawanna plant employment had declined from almost 20,000 in 1965 to 8,500 in 1977 before further declining to a skeleton crew in 1982. The loss of these jobs results in a major fiscal crisis for the City of Lackawanna and a crisis for Buffalo and towns in Erie County. The effect on the local economy is significant. 1978 - More than 21 million tons of steel are imported. 1981 - Bethlehem's sales reach a record $7.3 billion. 1982 - Bethlehem reports a record loss of $1.5 billion, the first of five years of losses as the steel industry goes through a period of unprecedented restructuring. Bethlehem eliminates steelmaking at Lackawanna and shuts down or sells other plants, mills, mines and shipyards. Total employment is reduced by more than half in the next five years. 1983 - Bethlehem Steel closes most of its Lackawanna steel making facility. The coke ovens and byproducts division, coals strip mill, 13" and 12" bar mills, and the galvanizing department still remain.